Vannesa Paukeigope Jennings, 1996. Photo by Lucille Warters. I first met Vanessa Paukeigope Jennings more than twenty years ago while working at the University of Oklahoma on a project to develop an exhibition on the Plains Apache (also known as Kiowa Apache) people of Oklahoma—From Generation to Generation: The Plains Apache Way. The development of this groundbreaking exhibition pioneered a new approach in the museum field that has since become the model for many exhibitions focusing on the arts, histories, and cultures of Native American people. Under this project completed in cooperation with the Apache Tribe of Oklahoma, tribal artists, traditionalists, leaders, scholars, and other community members for the first time were not only the subjects of the exhibition but were actively involved in providing their own perspectives, directions, and inspirations from which exhibition content and design were developed. Most of the works included in the exhibition were actually created by contemporary Plains Apache artists. The young woman was surprised to see two strangers appear at her door, but she welcomed us into her home, where we spent the afternoon learning about her work in beadwork and other arts, her heritage as a traditional woman learned from her Kiowa and Plains Apache grandparents, and the legacy she hoped to pass on to her own children. 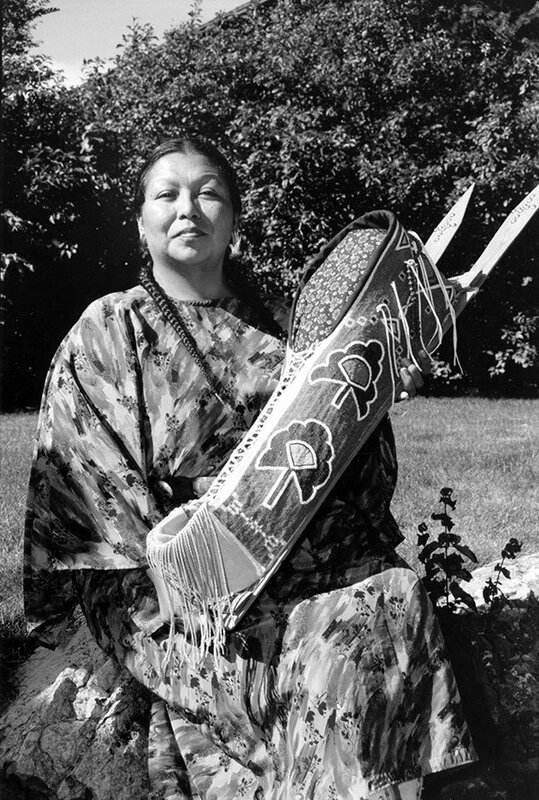 She brought out a large trunk that contained a dress made of soft tanned deer hide with simple but elegant beadwork that had been made by her grandmother, Jeanette Berry Mopope; and, she talked abut her childhood with her grandparents filled with traditional teachings, stories, songs, ceremonies, and powwows. By the end of the visit, she had agreed to make the dress for the exhibition. Paukeigope has since acknowledged that the making of that child’s dress—her first work of art made for a museum—was the beginning of her career as a traditional Southern Plains artist. Since that time she has received numerous national and international awards and recognition of her artistry, exhibited her hide clothing, beaded cradles, and other creations in major North American museums, and sold many examples of her work to discriminating collectors of Native American art. Ironically, like many American Indian artists, Paukeigope did not support herself through sales of her artwork and, for most of her life, she earned her living as an employee of the Bureau of Indian Affairs. Vanessa Santos (Morgan) Jennings was born on October 5, 1952, in Tempe, Arizona, the daughter of Laquinta Mopope Santos and Clifford Santos. Her father was from the Gila River Pima Reservation and her mother was a young Kiowa and Apache nurse from Oklahoma working for the Indian Health Service in Arizona. Paukeigope was the oldest grandchild of renowned Kiowa painter Stephen Mopope and Plains Apache traditional artist Jeanette Berry Mopope. She credits her grandparents, who brought her from Arizona to live with them on their Oklahoma allotment when she was a year old, for teaching her traditional Kiowa and Apache philosophies, manners, and arts that have guided her throughout her life. Paukeigope acknowledges not only her grandparents, but also the generations who went before them for her place in life as an accomplished artist and traditional Kiowa and Apache woman. She is named for her maternal great grandmother Paukeigope (Etta Mopope). 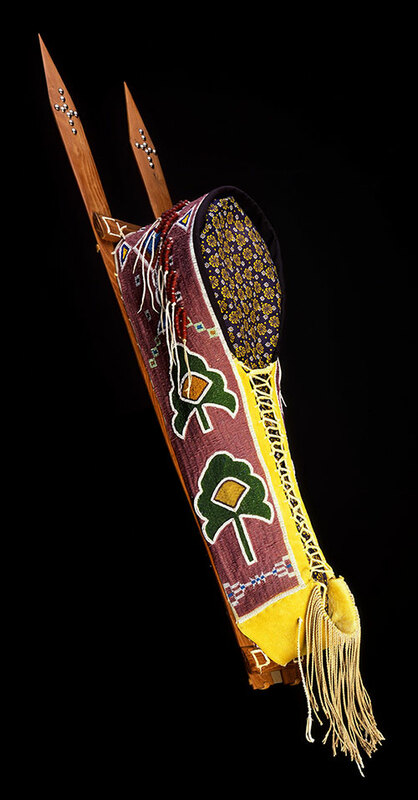 She and her mother Keintaddle were well-known Kiowa beadwork artists, singers, storytellers, and makers of cradles. Another great grandmother (the mother of Jeanette Berry Mopope) was Anna E. Jones Berry, who was also a beadworker and cradle maker. Paukeigope describes her life as a part of an ancient continuum built upon the accumulated knowledge and experiences of her familial ancestors that carries into her children and grandchildren’s generations. For this reason, she feels an obligation to pass on to her children and grandchildren the Kiowa and Apache traditions, philosophies, and arts that she learned from her grandparents. Before beginning to do beadwork in earnest at the age of eleven, Paukeigope sorted beads for her grandmother as she created cradles, dresses, moccasins, leggings, and purses. She said that her grandmother always made wonderful dresses, moccasins, and leggings for her and her younger sister Stevette for the round of powwows and ceremonies the family attended. Her grandmother also made powwow clothing for Kiowa, Apache, and members of other Oklahoma tribes. She recalls that her grandmother had very strict beliefs with regard to colors and designs. She taught her to have respect for family designs and to use only designs that belonged to their family. To copy another family’s design would be disrespectful and dishonest because each design has a life and history of its own. The only time she should use another family’s designs is if they were given to her by a family member such as an elderly beadworker with no daughters or granddaughters who wanted to ensure that a design would be preserved for posterity. Another important influence in Paukeigope’s life is her participation in the O-Ho-Mah Lodge Society, a Kiowa war dance society with roots deep in tribal history. The long time involvement of her family in O-Ho-Mah Lodge is reflected in the songs of her grandfather Stephen Mopope and his father George Mopope, who continued to support the society during the early reservation period despite threats from Indian agency officials. Their songs are performed at ceremonies each year. Both of her sons, Gabriel and Seth, also have their own songs as active members of O-Ho-Mah Lodge. Paukeigope’s traditional artwork includes dresses, leggings, cradles, lances, horse equipment, shirts and jackets, dolls, and other objects. She has taught bead working within her own tribal community and traveled nationally and internationally for presentations on her work. In 1989, she was awarded a National Heritage Fellowship from the National Endowment for the Arts in recognition of her mastery of Kiowa traditional arts. Other honors include the President Award from the Red Earth Festival and First Place Awards at the Santa Fe Indian Market. In 1996, she and her work were honored at the Center’s Plains Indian Seminar titled Powerful Expressions: Art of Plains Indian Women with the keynote address delivered by Dr. JoAllyn Archambault of the National Museum of Natural History of the Smithsonian Institution. In this presentation, Dr. Archambault noted “the way Vanessa lives epitomizes the best kinds of values and virtues of Plains Indian women.” In June 2004, she will be recognized at the Oklahoma City Red Earth Festival as the Honored One—the highest award of this annual celebration of Native arts. 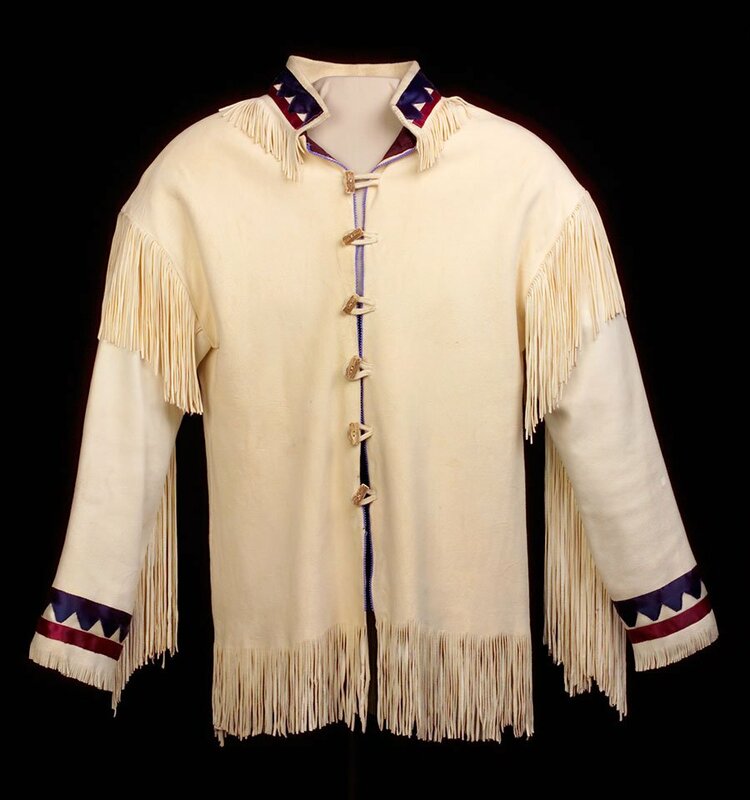 This jacket featuring colorful ribbon work and soft tanned deerskin is an example of the simple elegance characteristic of southern Plains. Jacket. Vanessa Paukeigope Jennings, Kiowa and Apache, early 1980s. Temporary loan from B. Byron Price. The pink beads in the cradle were given to Paukeigope by Occitan-speaking people of the Provence region of southern France. She met this group of people, united by a desire to maintain their distinctive dialect, on a trip to France in the summer of 1992. Since that trip, strong friendships have developed, and she has made three additional visits to this region. For her next visit, she will be taking a cradle with a beaded design featuring words of the Occitan dialect to be given as a gift. According to Paukeigope, the pink color of the beads reminds her of the subtle pink and purple hues of prairie grasses in Oklahoma as they are moved by the wind. 1. Vanessa Paukeigope Jennings in a presentation at Plains Indian Museum Seminar in September 1996. 3. JoAllyn Archambault in Kiowa Generations, Plains Indian Museum Seminar, September 1996. 4. Vanessa Paukeigope Jennings, “Why I Make Cradleboards.” Gifts of Pride and Love: Kiowa and Comanche Cradles. Barbara A. Hail, Editor. Haffenrefer Museum of Anthropology, Brown University, 2000, p. 96. 5. Ibid, p. 98. 6. Vanessa Paukeigope Jennings, phone interview, March 11, 2004. 7. Jennings, 2000, p. 95.